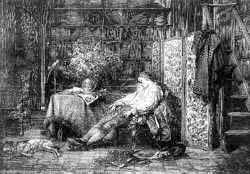 Linnaeus in his room as a student. Note all the exciting objects found in nature! Painting by Louis Prosper Roux 1847, Linnaeus’ Hammarby. ”My dear Reader, you should have seen his museum, which was kept open for his audience and, highly entertained and full of admiration, you would have loved the host. The ceiling was decorated with booty taken from birds, on one wall was the Saami costume, on the other the larger plants and a collection of shells. The two remaining walls were splendidly decorated with books on medicine and natural history and with scientific instruments and rock specimens.